Hello! Thank you for checking out the blog. You can find continuing recipes, thoughts, and projects over at my new website, Daily Confessions of an Unintentional Housewife. I’m exploring the transition from Breadwinner to stay-at-home housewife. It’s shocking how much I enjoy making things from scratch and taking care of my house and husband – I never thought I’d be cut out for this! I hope you’ll enjoy the new blog, and I look forward to hearing from you over there! So I was looking into what I could make for hubby that he’d reallyl enjoy. I’m trying this “housewife” thing, and it’s more difficult than I knew. I always thought that I’d be able to have a hot dinner on the table if only I had more time. But that was before I knew that Netflix has Veronica Mars seasons 2 & 3 on Instant View. Here’s what I came up with for tonight: Pulled Chicken Sandwiches. Because (if you’re new to reading this, you’ll soon find out) I have chicken. I do not have pork. I made these sandwich rolls recently too, and I’m hoping that I get extra dinner points to overcome the fact that I have no laundry points for this week. In a large mixing bowl, combine 1/2 cup flour, the active dry yeast, the honey and the warm water. Stir well and let sit for 10 minutes, until slightly foamy. Stir in yogurt, vegetable oil, salt and 2 cups of the remaining flour. Gradually stir in more flour until you have a soft dough that sticks together pulls away from the sides of the bowl (This can all be done in a stand mixer with the dough-hook attached, as well). Turn out dough onto a lightly floured surface and knead, adding additional flour if necessary to prevent sticking, until dough is smooth and elastic, or about 5 minutes. Place in a lightly greased bowl, cover with plastic wrap and let rise for 1 hour or until doubled in size. Turn risen dough out of bowl and onto a lightly floured surface. Gently deflate, pressing into a rectangle. Divide dough into 10 even pieces with a board scraper or a pizza cutter. Shape each piece into a round roll. To do this, take all the corners of one of the squarish pieces you just cut and pull them together, pinching them to create a seal. This will pull the rest of the dough “tight” across the top of your roll, giving you a smooth top. Place on prepared baking sheet. Repeat with remaining dough. Once all rolls have been formed, press down firmly on each one to flatten. Cover with a clean dish towel and let rise for 25 minutes. Bake for about 20 minutes, until rolls are deep golden on the top and the bottom. Finely chop onions and mince garlic. In a 6-quart heavy saucepan combine onions, garlic, vinegar, butter, ketchup, Worcestershire sauce, 2 tablespoons Tabasco, salt, and pepper and simmer, covered, stirring occasionally, 15 minutes. Add turkey breast, cavity side down, and cook at a bare simmer, covered, 2 1/2 hours. Transfer breast to a cutting board, reserving sauce, and cool until it can be handled. Shred turkey meat, discarding bones, and stir meat into reserved sauce. Simmer barbecue, covered, over low heat, stirring occasionally, 1 1/2 hours more and season with salt, pepper, and additional Tabasco. If using boneless, skinless breasts, SUBSTITUTIONS: replace half the vinegar with chicken broth, double the butter, and add 1/4 cup brown sugar. But with the skin and bone, it’s much, much better. The sandwich rolls are lovely. Trav said that he liked the pulled chicken. It was a little vinegar-y for me, but that might be mostly because of how I forgot to check on it a couple of times, and then the sauce was all cooked to goo and I used vinegar and ketchup and chicken stock (but a lot of vinegar) to create more liquid. He said that he likes a vinegar-y barbecue, so maybe that’s what he liked about it. Anyway, it’s worth keeping in the recipe file. Finely chop walnuts. In a small heavy skillet cook walnuts in oil over moderate heat, stirring, until golden and transfer with a slotted spoon to paper towels to drain. Have ready a bowl of ice and cold water. In a kettle of boiling salted water blanch beans 1 minute and immediately transfer with slotted spoon to ice water to stop cooking. Drain beans and gently peel away outer skins. Return kettle of water to a boil and cut potatoes into 1/4-inch-thick rounds. Cook potatoes 8 minutes, or until just tender, and transfer with slotted spoon to ice water to stop cooking. Drain potatoes in a colander and pat dry with paper towels. Assembly: Spread about 1 teaspoon Gorgonzola cream on each potato slice and top each canapé with a bean, pressing down gently. Sprinkle canapés with walnuts. Canapés may be assembled 6 hours ahead and chilled, covered. These were fine. They weren’t spectacular, and they took quite a bit of work for the outcome. On the other hand, I didn’t have to go grocery shopping, and I used produce from the CSA. Even though I have an unholy love of all things crostini, it’s a little weird when they’re done with potatoes instead of bread. I know starches are meant to be interchangeable, but I found it a little strange. So in the end, I likely won’t make quite this item again. I may decide that the flavor was good enough to create a fava bean, blue cheese potato salad, but we’ll have to see whether I even decide that’s worthwhile. Just FYI: there’s likely to be a lot more about flatbreads here. I’m thinking about perfecting the process of making every flatbread from every culture. As long as I can use my Cuisinart or KitchenAid, of course. I’m feeling really good about pizza crust and pita breads, and I’m on the verge of getting tortillas just how I want them. Next up will likely be naan, just because I love it. My father mentioned lavash, and Ethiopian flatbread (whatever that’s called), and apparently there’s a sweet version from Norway… Anyway, this is a warning that many of my recipes and posts will likely involve flatbreads. Because I love them. Which is why I re-tried that flour tortilla recipe from The Weekend Gourmande. I (of course) converted it to the Cuisinart and tried cooking it with the newfound knowledge I gained from Pioneer Woman. This time, the tortillas came out just the right color. They had a lacing of golden brown on one side and spots of dark brown on the other. These are a bit thicker than the lard-version, and I don’t know how well they’ll hold up as burritos because of that factor. However, they cooked up beautifully and I’m considering how they would work with an extra step of rolling them out just before cooking. Yes, that would mean that I’m resting the tortillas 3 different times, in 3 different shapes in the recipe. But the alternative is driving to BONNEY LAKE for one ingredient. I’m only really lazy when it involves going out in public. And mixing things by hand. And housework. Other than that, I have dogged determination that will see me through this flatbread experiment. I’m quite looking forward to it. Admit it – there’s no such thing as too many posts on flat bread recipes, right? That’s what I thought. I found this one at greekfood.about.com, and I like how it turns out. It took some experimentation to find the pita recipe we were really interested in eating. We love pita bread as a flat bread, not as a pocket bread so much (although sometimes these will inflate and create pockets as well). Our breads are a little thicker than the pocket breads usually are (1/4″ – 3/8″ or so) and are perfect to use for dipping in hummus or heating up with feta on top. Dissolve in the yeast and sugar in 1/2 cup of warm water and set aside, covered, for 15 minutes. Dissolve salt in the remaining 1 cup of warm water. In a large mixing bowl, add flour and make a well in the center. Put flour in the blow of an 11-cup food processor. Pulse briefly to settle the flour. Continue pulsing while adding Add yeast mixure and salt water in a steady stream. Continue pulsing until dough forms, then turn food processor on for 30 seconds or so. Knead with hands for 10 minutes in the bowl. Add olive oil and continue to knead process until all oil is absorbed. Shape into a ball in the bowl, place in 8-cup measuring cup, cover tightly with plastic wrap, and place in a warm area to rise until doubled in volume, approximately 1 1/2 to 2 hours. Punch down the dough and knead for 5 minutes more briefly. Preheat oven to 350°F (175°C), and lightly oil baking sheets tear commercial-sized parchment paper in 1/2. Take pieces of dough slightly larger than an egg and roll out on a floured surface to a thickness of 3/8 to 1/4 inch. (For larger or smaller pita bread pieces, take more or less dough). Prick the bread with a fork in several places and brush lightly with olive oil. Place on baking sheets parchment paper and bake at 350°F (175°C) on the lowest oven rack for 2-3 minutes, then turn the pitas over and bake for another 2-3 minutes. Remove from oven and place on another sheet of parchment paper tray covered with a clean dishtowel, with another clean towel on top. When thoroughly cooled, pitas can be stored in plastic bags in the refrigerator, or frozen. Before using, brown in a lightly oiled frying pan for a few minutes until browned on both sides or re-heat briefly in the oven. We love these pitas. I made a whole mess of them (I think it was three recipes or more) recently to take on family vacation with us. They’re absultely wonderful. They’re good used to make pita sandwiches, used as thick wraps, or cut into wedges to eat with dip. You may have noticed that the technique I use for these pitas is pretty much the same as the technique I use for pizza crust. That’s just because I’m really lazy. And I don’t enjoy mixing any kind of dough by hand. If it can’t be made in a Cuisinart or KitchenAid, I’m not likely to cook it. Luckily, most recipes can be adapted to one contraption or another. My good friend thought I would like Pioneer Woman (how well she knows me!) and I spent some time this afternoon checking out what look to be amazing recipes. I was just browsing through until I came to a recipe for homemade flour tortillas. Anyone who has read anything on this site knows how I love my flatbreads! I tried flour tortillas a few months ago, but found that the ones I was making didn’t turn out how I’d hoped. It turns out that Pioneer Woman has a recipe using lard. I’ve never used lard before to my knowledge, but it sounds like just the thing to add flexibility and chewiness to my flour tortillas. Here’s me giving it a go! Add spoonfuls of lard or shortening (use 1/2 cup PLUS 2 tablespoons), then use a pastry cutter crumble the lard with your hands to combine the ingredients. Cut mixture until it resembles coarse crumbs. Roll into ping pong size balls, place on a tray piece of parchment paper, cover with a tea towel, and allow to rest for another 20 to 30 minutes. When you’re ready to make the tortillas, heat a dark or cast iron griddle flat pan to medium/medium-high 7.5 heat if your electric stove goes to 8 (and then HI). Be sure to allow your pan to fully heat, or you’ll think it’s too cool and then you’ll turn it up, and then you’ll burn some… One by one, roll out balls of dough until very, very thin. Throw tortillas (one by one) onto the griddle. Cook on each side for 20 to 30 seconds, removing while tortillas are still soft but slightly brown in spots. Remove and stack tortillas, and cover with a towel to keep warm. Serve immediately or allow to cool before storing tortillas in a container. To warm, nuke tortillas in the microwave, or wrap in foil and warm in the oven. These are really wonderful. Travis loved them. I loved them. They had a strange texture when we used them to make our normal tacos. Instead of getting hard and crispy and weird, they were instead still pleasantly soft. I don’t know if that’s the lard or the fresh-cooked aspect, but I’m calling it a “win” for now. Now that I’ve figured out the intricacies of actually cooking the tortillas, I’m going to have to try the other recipe again. Not that I have anything specifically against lard, but it’s difficult to find in our city. And then it is partially hydrogenated, when the entire point of lard (for me) is to avoid the trans-fats (and stick with the regular fats only). There’s apparently a butcher in Bonney Lake that makes their own lard, but since I can’t seem to get myself to the store to buy bacon, going a few towns over for lard seems… let’s go with unlikely. We’ll see. I’ll admit – just two years ago, I would have categorized myself in the group of people that learned everything they knew about fava beans from Dr. Hannibal Lecter (liver & a nice Chianti, anyone?). Then they appeared in my CSA share one week and I asked what to do with them. I was surprised at the enthusiasm Valerie answered with – she really loves these beans. A little research for recipes, and I found that seasonal eaters and farmers from around the country look forward to the taste of fava beans as one of the harbingers of spring. After last year’s fava bean season, I find myself re-categorized. 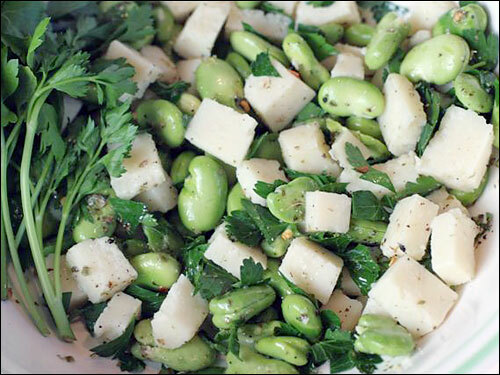 So today, two different fava bean recipes – enjoy! Fava beans are a spring favorite in southern and central Italy. This salad, adapted from Patricia Wells’ Trattoria (William Morrow 1993) is popular as a starter or as part of an antipasto spread. If you can only find a hard grating pecorino, use a soft goat cheese. If there are leftovers, saute the beans and cheese with a little oil in a small skillet. They are fragrant and delicious as a warm appetizer. Bring a small or medium pot of water to boil. Meanwhile, string and shuck the beans. Add the beans to the boiling water for one minute, then drain & run under cold water to stop them from overcooking. Each individual bean has a waxy coating that needs to be removed – the bright green bean will look so much “springier” than the pale green casings do. In a medium bowl, combine all ingredients, and toss to blend. Taste for seasoning. Obviously, I made quite a few changes to the recipe, based on what we actually had here. I don’t know how true to the original we were, but this dish was full of flavors we love, so I think we made the right choices! Favas lend a fresh note here. For the most robust flavor, use tuna packed in olive oil rather than water. Preheat oven to 350°F. Arrange baguette slices in single layer on baking sheet; brush slices with 3 tablespoons oil. Bake until bread is crisp and golden, about 15 minutes. Rub fresh garlic clove on each baguette slice. Season with salt & pepper to taste. Set aside. Bring medium saucepan of water to boil. Shell fava beans, then drop beans into boiling water and cook 1 minute. Drain. Slip beans out of skins. Place beans in small bowl; add remaining 1 tablespoon oil and toss to coat. Combine tuna with its oil, minced red onion scallion, chopped parsley, and lemon juice in small bowl. Using fork, mash tuna mixture to coarse paste. Season mixture to taste with salt and pepper. Baguette slices, fava beans, and tuna mixture can be prepared 4 hours ahead. Let baguette slices stand at room temperature. Cover and refrigerate fava beans and tuna mixture separately. Divide tuna mixture among baguette slices. Top with fava beans and garnish each with 1 parsley leaf. I have what may be described as a crazy amount of love for all things crostini-related. At our engagement party, Travis & I had several appetizers that involved crostini. We (along with several of our closest friends) made about 15 loaves of bread into crostini. That may be an exaggeration – it’s been 4 years – but I’m pretty sure that there were more than 10 loaves of bread. We had bruchetta and tapenade, and I ate those leftovers for the next week straight. I did not know about fava bean & tuna crostini back then, so it wasn’t on the menu. But that doesn’t mean that I don’t love this version of crostini topping as well! This week, we had potatoes in the CSA for the first time this season. Of course, this early in the season, they’re bitty. I love potatoes in many different (fat and/or dairy-soaked) preparations, but with new potatoes, I love the simplicity of roasting. Since they’re too small for me to want to peel and since their skins are so tasty anyway, this is a delightful way to prepare spring potatoes. Trav and I let our potato plants die again this year, but maybe next year we’ll actually have potatoes from our own yard as well! Here’s a quick, easy recipe for roasted tiny potatoes, tossed with lemon for brightness and sweetness. Of course you can also add in other things like herbs, or a bit of chopped prosciutto. Try some leftover new potatoes baked with an egg on top, too! That’s a wonderful spring breakfast. Heat the oven to 450°F. Clean the potatoes and pat them dry. Saute the garlic in the olive oil for a moment or two, until fragrant. Toss the potatoes with enough olive oil to coat, and with salt and pepper. Spread them on a large baking sheet and roast for 20 minutes, or until they are tender enough to be pierced with a fork, and their jackets are wrinkled and crispy-golden. Toss immediately with the lemon juice and zest, and serve. Options: After roasting, toss with a bit of chopped mint, rosemary, or thyme. Toss with chopped cooked bacon, or pesto. This is strongly based on the America’s Test Kitchen Family Cookbook recipe, and we make it enough that I’ve stopped measuring. This is something I always like to have on hand during the early season of the CSA (when we have lettuce every week and there’s always something I enjoy raw, dipped in dressing). This week, I enjoyed this as a dip for kohlrabi, snap peas, celery, and even as salad dressing (on salad)! splash vinegar (white wine vinegar is recommended, but as long as you don’t mind a brown tint or red tint to your dressing, balsamic or red wine vinegar will both work as well). In a small bowl, combine blue cheese, garlic, and buttermilk. Mash together with a fork until the mixture has a cottage cheese-like consistency. Add remaining ingredients and mix together. Use as a dip or to top salad. What I love about this recipe is the extra bite that comes from the fresh garlic as well as the tang from the buttermilk. Although many grocery store brands of blue cheese dressing are overly heavy on the mayonnaise taste, this recipe includes both buttermilk & sour cream to round out the flavor. I really dislike being able to taste the mayonnaise, so I go easy on that part and then increase the sour cream. I love this recipe, and I’ve even added buttermilk to our milk delivery schedule so that I never have to run to the grocery store for buttermilk to make this recipe happen. I do have to figure out how to make buttermilk pancakes or biscuits or something though, since I don’t like the taste of buttermilk by itself and I don’t ever use up the whole carton before it goes bad. Holy greens, Batman! 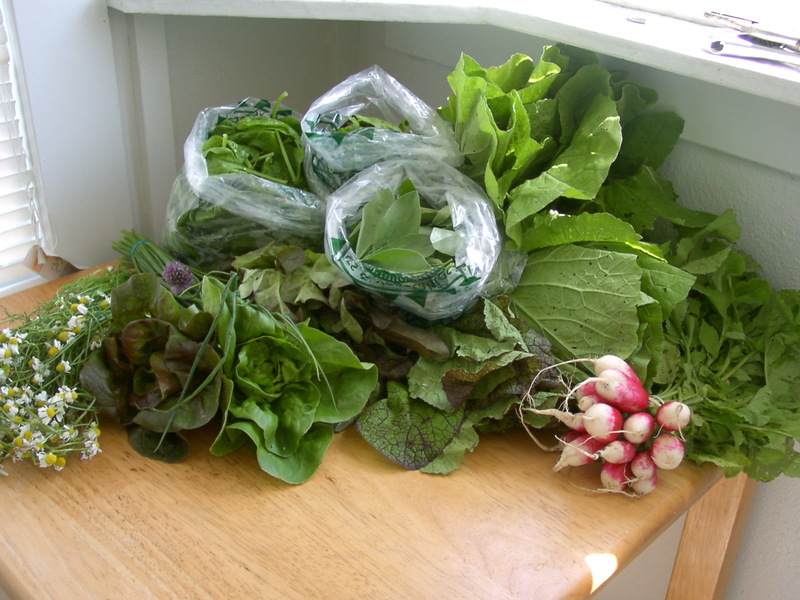 With a cold, wet spring in the Northwest, the CSA share is all about the green. I love the little baby lettuces – that’s gonna be salad very soon! Because of a scheduling issue for Tuesday (our CSA pick-up day), I didn’t take my normal photo of the share listing for the week. From the newsletter, I see that the tasty, unitentified leaves I just munched are fava leaves. We’ve got braising greens, spinach, three kinds of lettuce, chamomile, chives, and radishes. Now, I’m not a radish fan, but it turns out that Travis has been avoiding eating the radishes we’ve gotten before ’cause he was saving them for me. Now that we’ve got that figured out, I’m sure they’ll be gone in a jif! I will definitely be making some kind of pesto out of this bounty, which will be just the thing to change up our pizza recipes this week!